The charango is a small Bolivian Andean stringed instrument of the lute family. 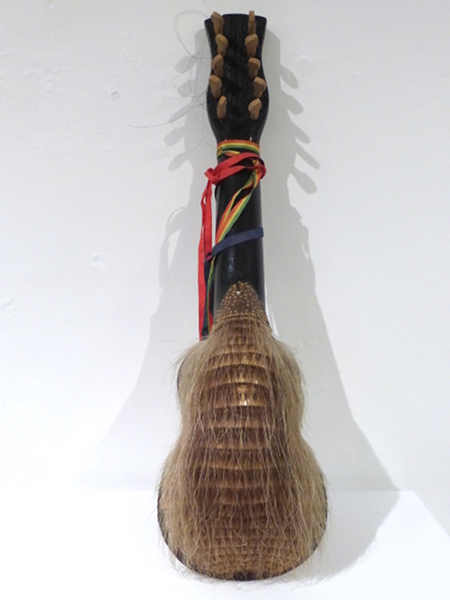 About 66 cm long, the charango is traditionally made with the shell of the back of an armadillo. The charango is primarily played in traditional Andean music, but is sometimes used by other LAtin American musicians. Many contemporary charangos are now made with different types of wood. It typically has 10 strings in five courses of 2 strings each, but other variations exist. The instrument was invented in the early 18th century in what is now Bolivia. The coloured ribbons adorning it are that of the national flag of Bolivia and the red and blue those of the University of Sucre. This instrument was a thank you front the university to the present owner.